9/1/16: Years of fillet board research and development are about to pay off. After many prototypes made at home, and several made commercially, we have now completed all test cycles and revisions and are beginning Production phase of actual boards and clamps 9/1/2016. After much field testing and proof of concept interviews we believe we have the first and most unique patented fillet board to reach the market in many years. Fillet A Better Way™. Try it for yourself. Anglers have cleaned, crappie, large mouth bass, small mouth bass, walleye, northern pike, bream, and more. 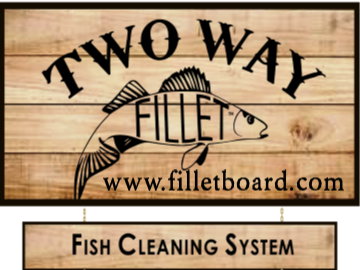 Their positive feedback has brought us to this final step to bring TWO WAY Fillet™ to market.